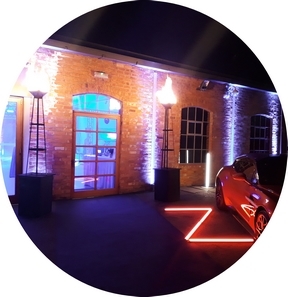 Gas Flamebeaux’s are a great way to liven up any grand entrance and give the wow factor for car shows, fashion shows or maybe you want a red carpet in front of your wedding marquee opening and have these as an addition. We can supply the Gas Bottles for you and an electronic lighter, or simply leave us in charge and we’ll be sure they are mounted safely and lit before your guests arrive. Usual running time is approx. 8-10 hours. Hit our contact button for a free quote or site visit, we’d love to help.